I work business hours each day, and my office is not really close to anywhere to eat, so, I have a pretty good walk ahead of me to find food when I'm hungry. 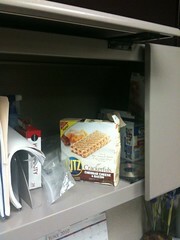 I do keep a few food items in my office because I tend to get hungry at weird times. Usually, those times are really inconvenient, too. My stomach goes off at 10:30 in the morning most days, and that is too late for breakfast most places, and too early for lunch. Ritz Crackerfuls are individually wrapped cracker snacks. They are large, sort of like a "cracker sandwich", rather than the standard issue of 6 small crackers in a snack package. They come in three flavors: Four Cheese, Classic Cheddar, Garlic Herb and Cheddar Cheese and Bacon. I was sent Four Cheese and Cheddar Cheese and Bacon for review. Now, I love cheese and I love Ritz Crackers, so I did like these a lot. There's a lot of cheese, you can really taste it and it tastes like actual cheese and they are quite filling. They're also easy to take with you when you're on the go. With 6 grams of whole grain and real cheese, Ritz Crackerfuls can also be a better choice than some other common snack foods. It's also nice for me to have something in the mid-afternoon to break up the day a little bit. I usually work by myself, so the time can drag a little, and I occasionally look forward to a break and something to tide me over until dinner. Want to win a $100 Visa gift card? That would buy a bunch of Ritz Crackerfuls! To enter, leave me a comment below and tell me what you enjoy doing to break up your day a little. Contest ends 10pm CST July 31, 2010. Also, you can save $1.00 on Ritz Crackerfuls filled crackers. Don't forget, you have 16 other chances to win at BlogHer, check them out, too!